The European Aviation Safety Agency and the Federal Aviation Administration are requiring all Boeing 737NG operators in Europe and the U.S. nearly to double the frequency of repetitive ultrasonic or (in the case of the FAA) eddy current inspections of each fan blade in the CFM56-7B engines powering their 737s. In new airworthiness directives published by EASA on September 28 and by the FAA on October 1, the regulators mandate all 737NG operators in their jurisdictions to reduce from 3,000 flight cycles to 1,600 cycles the interval between each repetitive CFM56-7B fan-blade inspection. EASA’s new AD becomes effective on October 5 and the FAA’s new directive takes effect on October 16. 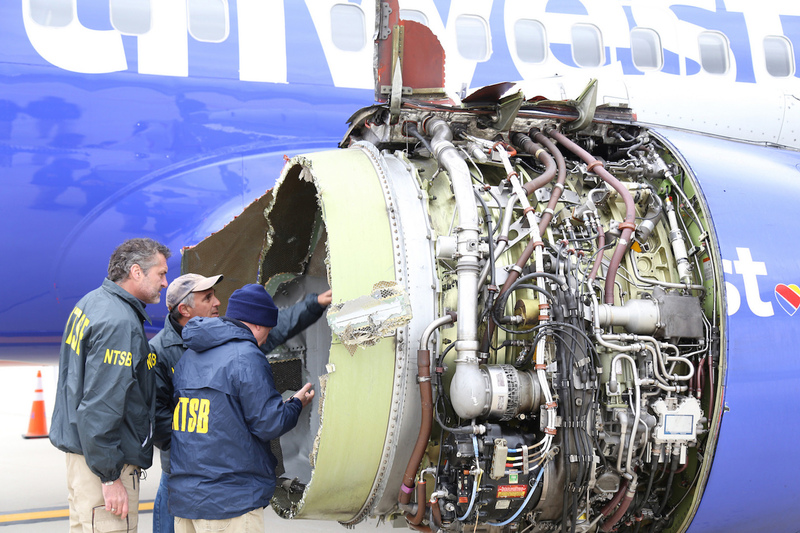 The agencies began requiring operators to inspect each blade every 3,000 cycles after a Boeing 737-700 operating as Southwest Airlines’ Flight 1380 from New York La Guardia to Dallas Love Field on April 18 suffered an uncontained fan-blade fracture in its number-one engine as the aircraft climbed through Flight Level 320. Debris from the fractured blade shattered a passenger-cabin window above the aircraft’s left wing, depressurizing the cabin and causing the death of the passenger seated next to the window. The aircraft’s pilots performed an emergency descent to land the 737 at Philadelphia International Airport. Following the Southwest accident, the FAA and EASA initially issued ADs requiring all 737NG operators to begin inspecting their CFM56-7B fan blades for possible cracks within a period of 43-133 days after April 20, depending on how many cycles each blade had accumulated. The new EASA and FAA requirements come as a result of analysis by CFM of the cause of the April 18 blade fracture. By July, CFM’s research into the root cause of the blade failure indicated that the repetitive fan-blade inspection interval needed to be reduced and the OEM notified operators of its recommendation in a service bulletin dated July 27. Southwest Airlines, which had already inspected the CFM56-7B fan blades in its entire 737NG fleet of nearly 700 aircraft following its April 18 accident, voluntarily adopted CFM’s 1,600-cycle inspection interval immediately. For newly introduced CFM56-7B engines, operators must perform an initial inspection of each CFM56-7B fan blade before the blade has accumulated 20,000 flight cycles. The FAA specifies that replacement blades for any CFM56-7B fan blade must not be installed unless the replacement blade has accumulated less than 20,000 flight cycles since new or if it has already undergone inspection in accordance with the new AD. The EASA AD includes a similar specification. The FAA estimates that its new AD will affect 1,858 U.S.-registered aircraft. The agency estimates each repetitive inspection of an individual blade will take two hours of one person’s work time at $85 per hour, for a total of $170 per inspection. EASA’s AD provides no estimate for the number of aircraft affected in Europe. In its original CFM56-7B blade-inspection AD of May 17, the FAA originally assumed incorrectly that the $204,000 cost for replacing two fan blades specified by CFM in its initial blade inspection and replacement service bulletin referred to the cost for replacing all 24 fan blades. As a result, in its new AD the FAA has amended the estimated cost of replacing one fan blade from $8,500 to $51,485, or $51,400 for the cost of the blade and $85 for one hour of one person’s work time to perform the replacement.